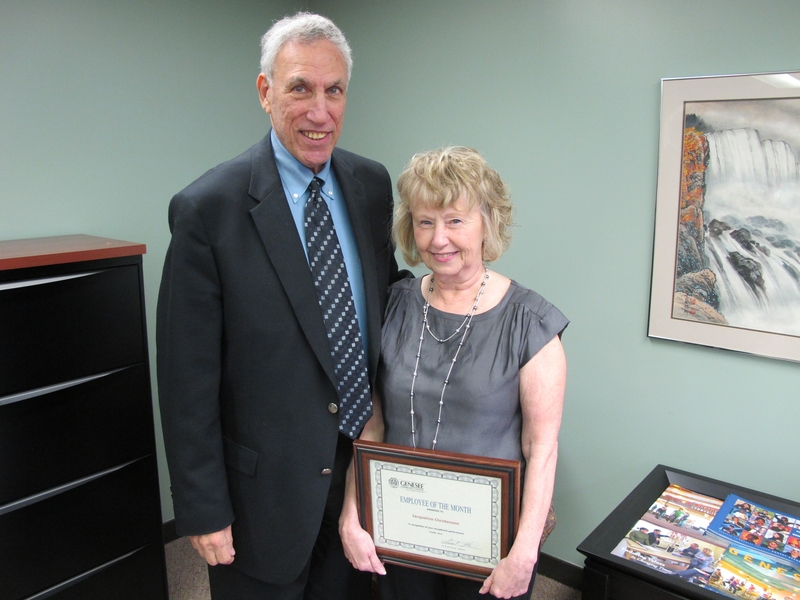 Genesee Community College is pleased to announce Jackie Christenson has been named the October Employee of the Month. Jackie is the College’s Alumni Affairs Coordinator and recently planned and successfully implemented Genesee’s first Homecoming celebration. In just a little more than a year’s time, Jackie has become an avid supporter of the College and a staff voice for Genesee alumni. She has improved the alumni phone-a-thon, revamped the alumni newsletter, and increased the alumni e-newsletter subscriptions four-fold. Jackie was the driving force behind the first Homecoming event that attracted over 200 alumni to the College. Jackie’s contagious enthusiasm and commitment have been noticed by hundreds of GCC alumni. Parts of Jackie’s duties as Alumni Coordinator include planning Homecoming, the Alumni phone-a-thon, Alumni Hall of Fame and Athletic Hall of Fame. Jackie’s responsibilities also include connecting with alumni through a monthly Alumni Connections e-newsletter, The Forum alumni magazine and other outreach programs and initiatives. Before working at Genesee, Jackie worked at Roberts Wesleyan College for 21 years as the Learning Center Office Manager, a Tutor Coordinator and later as the Director of Alumni Programs. Jackie holds a bachelor’s and master’s degree from Roberts Wesleyan College. Jackie resides in Scottsville, NY and has two sons, Jeff and Steve and two daughters-in-law, Jackie and Tarah. She enjoys spending time with her family, especially her three grandchildren Maggie, Claire and Reid. Outside of work Jackie enjoys dancing, camping and spending time with her dog Mandy.